Southern junior Weston Thorla (4) releases a shot attempt over a Wahama defender during a Jan. 24 TVC Hocking boys basketball contest at Gary Clark Court in Mason, W.Va.
South Gallia junior Braxton Hardy releases a shot attempt over an Eastern defender during a Jan. 30 TVC Hocking boys basketball contest in Mercerville, Ohio. COLUMBUS, Ohio – The Division IV boys basketball All-Ohio teams were announced Monday by a statewide media panel. The teams were selected by members of the Ohio Prep Sportswriters Association. 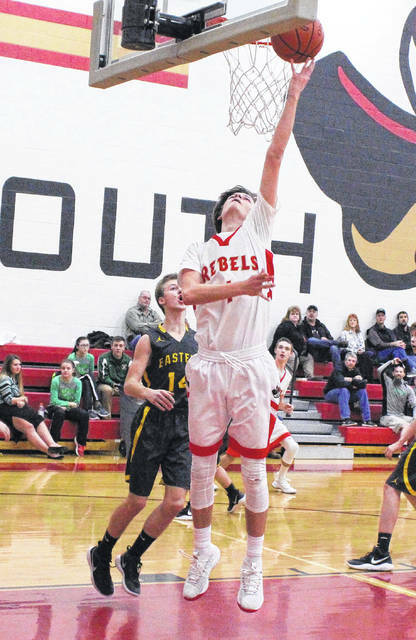 The Ohio Valley Publishing area had three players chosen to the D-4 squads as honorable mention selections, with Southern, Eastern and South Gallia each coming away with a single honoree. All three local choices are first-time recipients of an All-Ohio selection, and each honoree just completed his junior season on the hardwood. 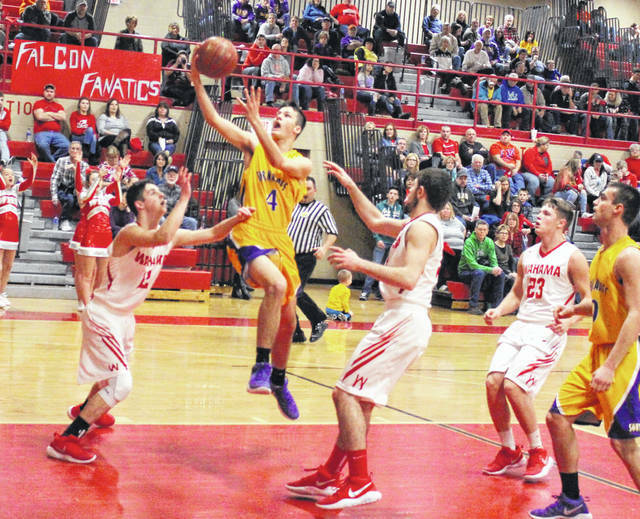 Weston Thorla — a 6-foot-3 guard — led the Tornadoes (14-8) in scoring this season and posted averages of 13.8 points and 3.1 rebounds each night. Braxton Hardy — a 6-foot-2 guard — paced the Rebels (7-17) in scoring and accounted for 17.9 points, 5.2 rebounds and 3.3 assists per game. Isaiah Fish — a 6-foot guard — led the Eagles (10-13) in scoring with 13.7 points per game while also averaging five rebounds a contest. All three local selections were also second team honorees on the 2018 OPSWA All-Southeast District squad for Division IV this winter. Senior Michael Bothwell of Willoughby Cornerstone Christian was named the state’s D-4 Player of the Year, while Chad Bever of Rittman was named Coach of the Year. Michael Bothwell, Willoughby Cornerstone Christian. Hadley LeVan, North Lewisburg Triad, 6-1, sr., 25.3; Tanner Arey, Peebles, 6-0, sr., 22.6; Scott Troyer, Berlin Hiland, 5-10, sr., 13.9; Skyler Durbin, Danville, 6-3, sr., 22.9; Zane Purvis, Millersport, 5-10, sr., 20.0; Devan Yarber, Oberlin, 5-11, sr., 14.3; Braedon Poole, McDonald, 6-5, sr., 26.0; Drew Johnson, Pandora-Gilboa, 6-6, sr., 17.8; Javin Etzler, Convoy Crestview, 6-7, jr., 15.2; Justin Sweeney, Lisbon David Anderson, 6-0, jr., 25.1.